Japanese wrestlers in action during “Wrestling for Peace Festival 2012” held at Qayyum Stadium in Peshawar on Wednesday, December 05, 2012. In this festival world fame Japanese Wrestler Inoki and his team members are participating. PESHAWAR, PAKISTAN, DEC 05: Japanese wrestlers in action during “Wrestling for Peace Festival 2012” held at Qayyum Stadium in Peshawar on Wednesday, December 05, 2012. 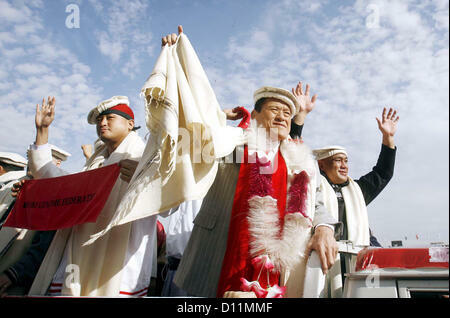 In this festival world fame Japanese Wrestler Inoki and his team members are participating. (Fahad Pervez/PPI Images).